Tim Claypole is founder and director of the Welsh Centre for Printing and Coating (WCPC). He is a faculty member of the College of Engineering, Swansea University. His areas of research include colour control, manufacturing systems, quality, maintenance, reliability experimental design, fluid mechanics and process thermodynamics. He is a British Expert on ISO TC130 on standards for the graphics arts. 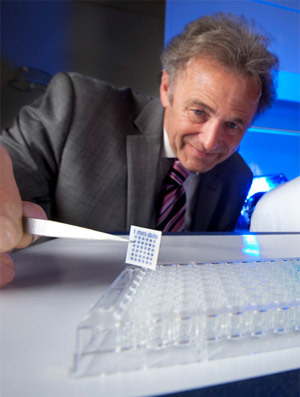 As well as graphics and packaging, he has internationally leading research on the use of volume printing processes for advanced manufacture of a diverse range of products including electronics, sensors and point of care health. Tim led the ERDF funded DIPLE project won the 2009 Regiostars award for ‘Research, Technology Development and Innovation’, reflecting the successful transfer of the research into industry. He was awarded an MBE for his services to graphic arts and industry in the 2010 Queens New Year’s Honours. His contribution to the printing industry has been recognised by the industry with the TAGA Michael award in 2008 and in 2009 an EFTA special award for outstanding contribution to flexographic printing. The EPSRC, Government and Industry have funded his research that has led to over 170 publications on printing and related topics. He recently finished a prestigious EPSRC Portfolio Grant in ‘Complex Fluids for Complex flows’, these are only awarded to World leading research groups. He is co-investigator on the EPSRC Centre for Innovative Manufacture of Large Area Electronics. This major UK award for research is held by the WCPC jointly with the other 3 UK Centres of excellence in Printable Electronics – Cambridge University, Imperial College London and Manchester University.